Graphite electrode (far left) that when electrolysed in molten LiCl with SnCl2 pellets forms Sn-filled carbon nanostructures (top right) or SnO2-decorated CNTs (bottom right). Lithium-ion batteries are already enabling a new generation of powerful mobile electronic devices. But to deliver more power for longer, materials with a higher lithium storage capacity than currently used graphite are needed. Sn-containing carbon nanotubes (CNTs) could be the ideal high-capacity material for anodes in advanced batteries but are difficult and expensive to produce. Now, however, researchers from the University of Cambridge have come up with a scalable and efficient alternative based on a molten salt process [Kamali and Fray, Materials Today Communications (2014), http://dx.doi.org/10.1016/j.mtcomm.2014.11.001]. “The lack of scalable methods for the preparation of Sn-containing carbon nanostructures is a barrier to the evaluation Sn-carbon nanostructures in an industry where tens of grams are required,” explains first author Ali Reza Kamali. The new approach makes use of a well-known process in which graphite is corroded in a molten alkali metal halide to form carbon nanostructures. By controlling the process conditions and feed materials, this simple electrolysis process can yield CNTs or spherical nanostructures. The process can be easily scaled up to yield significant quantities of carbon nanostructures quickly and economically. The set-up consists of a graphite crucible containing LiCl, which is heated up to around 770°C in an Ar atmosphere. A graphite rod is submerged in the molten salt and a current applied. The electrolysis reaction erodes the graphite cathode and distributes the material throughout the molten salt. When the crucible is cooled to room temperature, the salt can be washed away to leave the carbon nanostructures. 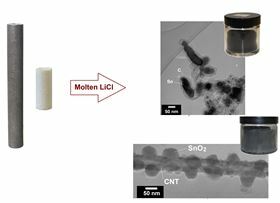 When SnCl2 is added to the LiCl gradually during electrolysis, the researchers found that carbon nanostructures filled with Sn are continuously formed. If the reaction is carried out in an atmosphere containing very small amounts of oxygen (even as low as 20 ppm), CNTs decorated with SnO2 nanocrystals on the outside are also formed. For good performance in lithium-ion batteries, the presence of tin oxides needs to be avoided. The researchers found that this could be achieved by performing the process under reducing conditions. The ability of the approach to produce large quantities of Sn-filled carbon nanostructures and SnO2-decorated CNTs could have a significant impact on the future of lithium-ion batteries, says Kamali. The researchers are now working on putting the nanostructures into actual lithium-ion batteries and looking to commercialize the technology with battery producers.